Blow out your candles, honey. I think that every milestone is more poignant when it is reached by your youngest child. The first step, the first word, the first day of school. For me, every “first” for my baby was my “last first”. Twenty one years ago tonight was a warm one, as I recall. The windows were open, and crickets were singing. We had put our kids to bed, our Katie and our little Mattie. She was a big girl of six, sleeping in her canopy bed, her pink and white bear in her arms. Matt was a baby still, not yet two years old, sleeping in his crib with blue pajamas on his sturdy frame. Paul went to bed, but I stayed up for a while, resting on our pull-out couch, feeling the various aches and pains of late pregnancy. I remember feeling very calm, very safe that night. I remember pushing a pillow behind my back and settling in to watch TV. And I remember realizing, somewhere around midnight, that my baby was going to be making an appearance before too long. I remember looking at myself in the bathroom mirror, smiling at my own reflection. “Hello, Momma.”, I thought. This was my third birth, my third time around. This time I felt prepared. Unlike the other two times, I didn’t know the gender or the name of this baby. This time I wanted to be surprised. I remember lying on the comfy pull out, watching the stars move across the sky, listening to my body as it readied itself to give me my last baby. I rested and dozed and waited, confident that I would know when it was time to head to the hospital. Trusting that all would be well. I remember holding Matt on my lap, still half asleep, as Paul fed the dog and put her outside on her lead. I remember Katie’s excited chatter as we climbed into the car. And I remember with perfect clarity how happy and whole I felt as we drove down the highway, into the rising sun. Our two children fell back to sleep, and Paul held my hand as he drove. We had Pachelbel’s Canon playing on the CD player, and the morning was quiet and blue and sweet. We watched the sky ahead of us turn slate gray, then orange, then lemon yellow as the sun rose up to greet us. At two o’clock that afternoon I gave birth for my third and last time. I held and kissed my sweet baby Tim. I looked at his beautiful face, his little dimpled cheek, his tiny hands, and I felt that my life was complete. Happy Birthday, Baby Tim. I love you as much as I did that night twenty one years ago. 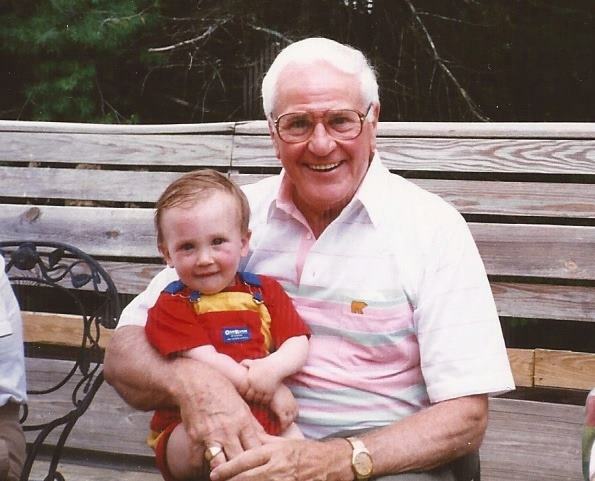 I love you as much as I did when you sat on Grampa’s lap at your first birthday party. As much as I did when I saw your first step, heard your first laugh, watched your first hockey game, handed you your first drum stick. You’re as sweet as I knew you’d be. ← How I can tell I’m crazy. I am happy that you have vivid memories of a very special event, and that you now have written those down to share. Happy Birthday to Tim! Can you delete this comment because it has my name rather than Embattled Farmers? I’m having a problem with Chrome, trying not to use it. Thanks so much. Duly deleted! But thank you; it was a lovely comment! Thank you, sorry for the trouble. I can comment if I start from my blog, which uses Firefox. If I try to comment when I get your latest post in an email, it’s through Chrome, which wants to out me! I’m sure one of your fourth graders could figure this out better, but since my dad passed away, I am the most technologically illiterate person in the country. He at least had the excuse of having been born in 1919. Can I be an Amish Catholic? I’m really good at useless stuff, like symbolism in fiction and poetry. That’s so sweet it makes me hungry … Mmmmmm — Tacobel’s cannon! That was beautiful, Moms. Happy (Belated B-day to Tim). I have always felt that when our kids celebrate their birthdays, we moms do, too. Happy Birthday to you and Tim!